The internet didn’t create kitchen envy, but it sure made it a heck of a lot easier to see how other people are transforming their spaces. You don’t even have to try to see dream kitchens pop up on the internet, it just happens as you scroll through social media apps or when home improvement store ads pop-up on your screen. And boy, you get to see some pretty cool stuff when that happens. You may not have even realized that you can get chrome tiles for your backsplash or that Smeg now offers Dolce & Gabbana inspired appliances. After seeing that, you know it is time to remodel your kitchen. If you are not affected by kitchen envy, there are still plenty of other reasons you should consider remodeling your kitchen. 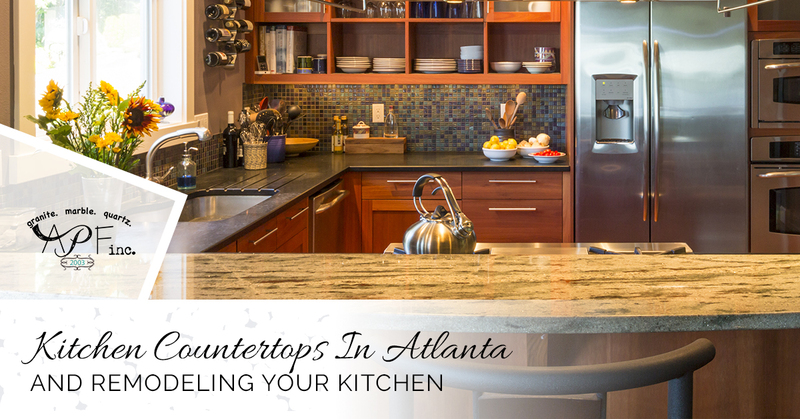 A Polished Finish, your source for kitchen countertops in Atlanta, offers these reasons to consider a kitchen remodel. The passage of time inevitably brings with it change. And with change comes a whole host of new priorities. This is the reason we see people constantly upgrading their electronics, as time ticks away, everything improves. Surely, your iPhone X is a much better product than a first-generation iPhone. This also happens to your kitchen. What was state-of-the-art when you had your kitchen remodeled 20 years ago is now grossly outdated. And even if your floor and countertops are still in good condition, in all likelihood they are seriously dated. In addition, you will also discover that your current kitchen doesn’t fulfill your needs. Renovation gives you the opportunity to create a kitchen that perfectly suits your family. Take a good look around your kitchen and make note of the things you don’t like. You may have loved the refrigerator when it was first installed, but that was decades ago and now you just put up with it. When there are too many components of your kitchen that you no longer like or enjoy, then it’s time for a remodel. Honestly, how bad do you feel when you visit a friend’s house and see their awesome kitchen? You have to admit, you want the same in your home. Instead of seething jealously, just get on with it and have your kitchen remodeled you it looks better than your friend’s kitchen. This is an obvious reason to have your kitchen remodeled. You might have a range in which only three burners work, your countertops are stained and full of scratches and other marks and the ice maker in your freezer stopped working six years ago, all very valid reasons to have your entire kitchen remodeled. That 1970s look your kitchen has was pretty cool in 2010, but that look is back out of style now. In other words; harvest yellow is out, as out as avocado-colored toilets. You could choose to wait it out until your kitchen comes back in style again. Of course, this might not happen for 20 or 30 years, if ever. People are really sick of avocado-colored toilets you know. As we gain greater consciousness of the need to be more energy-efficient, we think about all of the ways in which we can cut energy use. One way is by having all of your kitchen appliances updated. To be sure, a new refrigerator will save a lot of electricity. Not only do you enjoy the satisfaction of decreasing your carbon footprint, you get to save money in energy costs as well. Change can be a really good thing. A remodeled kitchen changes things up in your home and makes everybody happy. For years, you have always wanted your kitchen to be a certain way and have a certain feel to it. Well, right now seems to be a perfect time to make that dream a reality. A remodeled kitchen will always add value to your home, which is quite the incentive for people who are ready to put their homes on the market. Even if you are just refinancing, a boost in the value of your home is never a bad thing. Start your kitchen remodel by giving A Polished Finish a call.